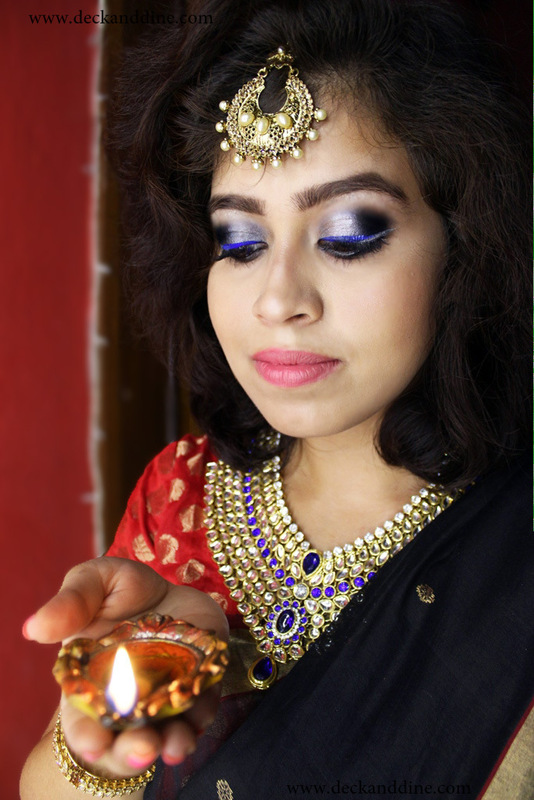 Kali Pujo/ Diwali is here and it is time to light up our house and life, time to celebrate with family and friends, time to gorge on delicious food without thinking about the tires under our clothes, time to have lots of fun and it is time to get decked up in our full glory. Corporate life leaves no stone unturned to make our life boring and throughout the year I just wait for the few days of Durga puja and Diwali to get decked up the way I like. I love going traditional during these days of festivities and saree is my ultimate love. 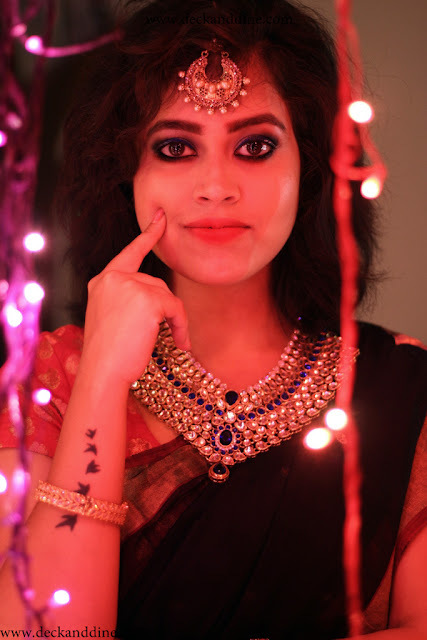 Although I love wearing a saree and I would jump at a chance to wear one on every possible occasion, but it doesn’t seem to happen every time in daily life. But at least these days I make it a point that I wear sarees only. 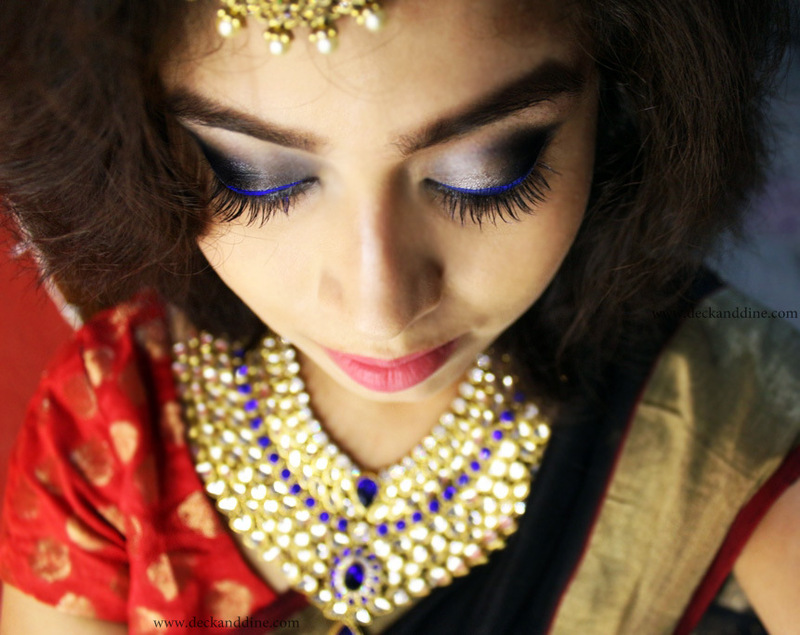 I am not really a salwar-kameez and anarkali-lehenga person, though you can often see me drooling over them. 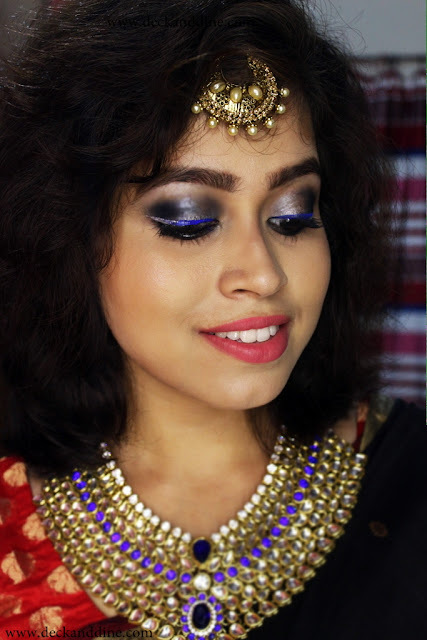 Today I am here to give a sneak peak of how I am planning to dress up this Diwali. I had no plans to what exactly I would wear and how I would I want the final look to be. I started my makeup and just thought to go with the flow. 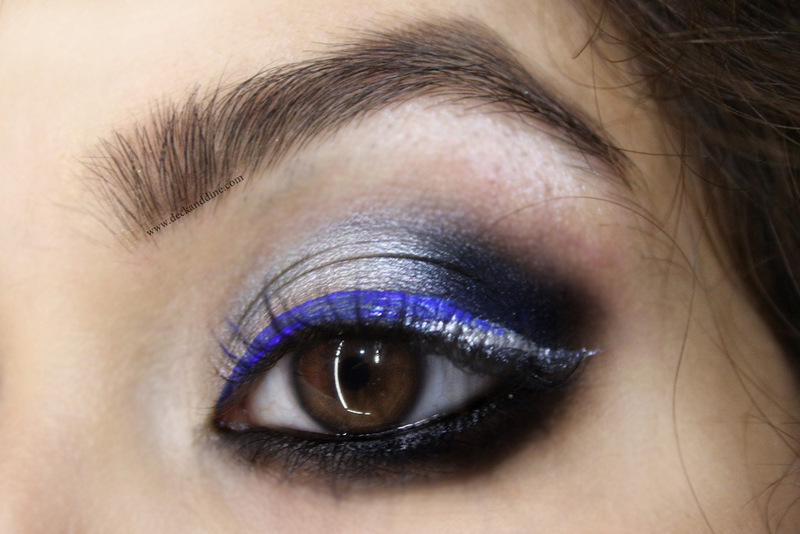 I went with silver and blue eyes with dual colored wing. I have totally forgot to film the step-by-step pictures. 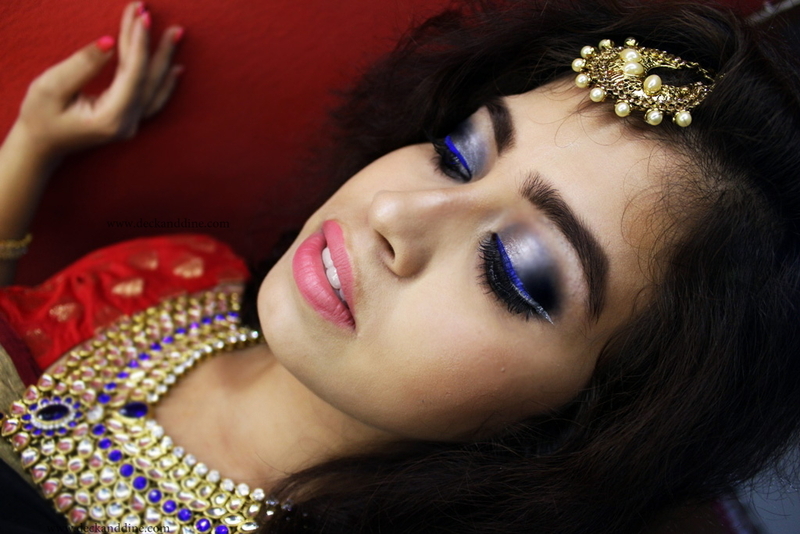 Let me know if you want me to recreate this eye makeup and post a tutorial. For lipstick, I chose a pale reddish pink. My blush is a peach colored one from my Ben Nye Blush palette. I left my hair open. Recently I chopped off my hip length wavy locks to this, so can’t really do much other than keeping it open. After I was done with my makeup, I opened my wardrobe and gazed at the sarees in a hope to select one that complement my look. But, my heart and eyes were both stuck to a black and red chanderi saree. 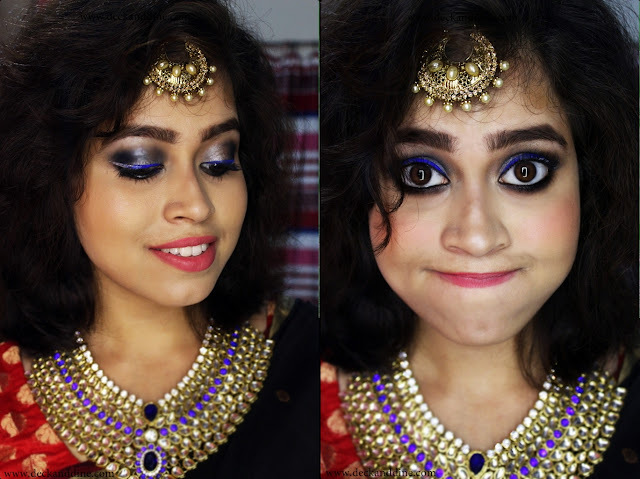 I didn’t think much and thought of donning that one, even if it clashes with the makeup. 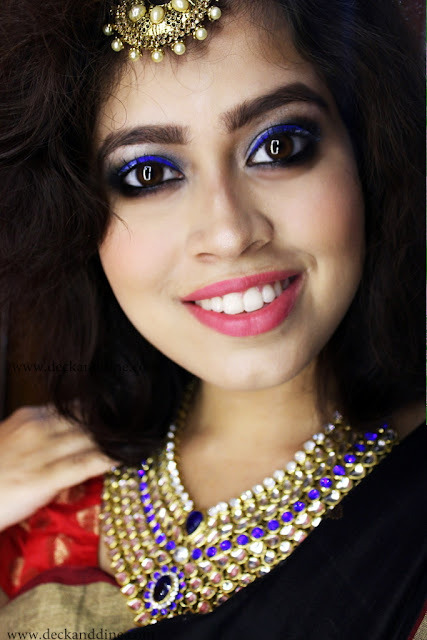 I love wearing saree in the usual, formal style, but it’s always great to spice up looks. Isn't? Adding some interesting twists to your saree-draping style can amp up your look while still being comfy. And the best part is, you can get the look without spending too much time and effort. For Diwali, I chose to wear saree in dhoti style. A style made famous by Sonam Kapoor, this looks beautiful when worn the right way. Wear blouse and leggings. 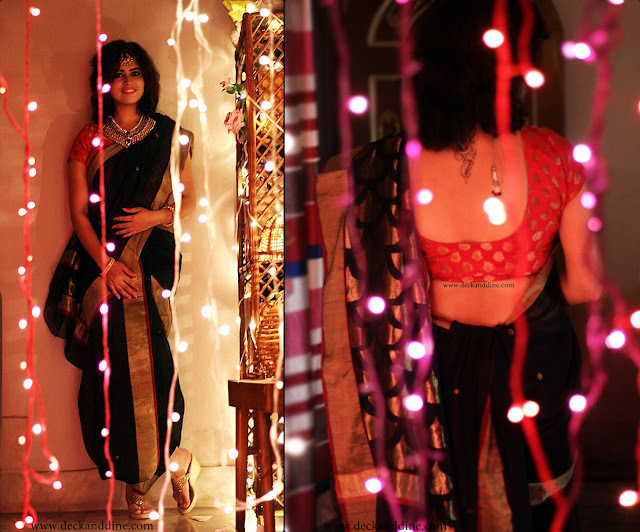 Checkout the tutorial of dhoti style saree draping HERE. the It sounds a bit complicated, but is actually pretty easy to do. I went with statement blue and gold kundan neckpiece and a golden maang tikka to complete my look. Again my eye makeup clashed with the accessories, breaking the “rules of style”; but obeying all the rules means missing all the fun. Isn’t? Wishing you all a very happy and safe Diwali. May every aspect of your life become as luminous and exciting as the lights flickering in the festival of lights. P.S. You can checkout my last year's Diwali look HERE. You look absolutely gorgeous, love the eye makeup. The outfit is so beautiful. I absolutely loved the whole look . 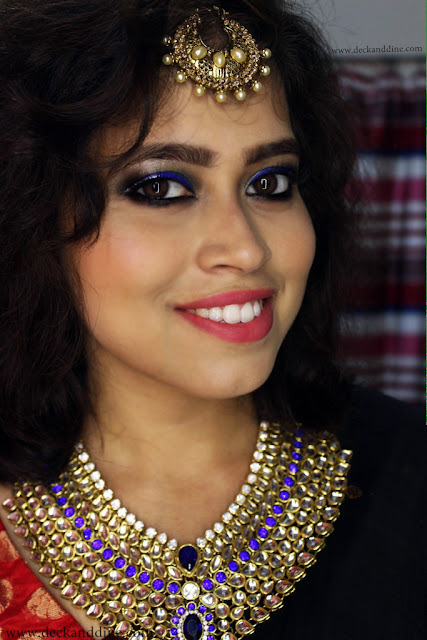 I really want to say that your eyes and the neckpiece are just too perfect !